The people of Newfoundland at the time of the first European visitors were the Beothuk, about whom little is known, beyond their extinction since 1829, and what record there is of their contact with early European explorers and settlers from various nations. Although until relatively recently John Cabot, who likely encountered the Beothuk, was credited with the European discovery of Newfoundland in 1497, archaeological finds at L'Anse aux Meadows indicate that Norse explorers landed and settled on the island approximately 500 years earlier. (Due to unknown factors, the Norse settlement was abandoned after a number of years.) There is also strong speculation, although as yet no undisputed evidence, that other explorers, ranging from Irish monks to Basque fishermen, visited Newfoundland in the centuries prior to the Norse arrival. The next European visitors were the fishermen who came to take advantage of the rich stocks around the island's shores. Over time, these seasonal visitors established informal communities around the coastline. Although Sir Humphrey Gilbert laid formal claim to Newfoundland on behalf of Britain on August 5, 1583, that country's early actions were aimed at discouraging settlement on the island. Merchants in Britain did not wish to lose their monopoly over the imported fish trade, and many felt that naval resources could not be spared to defend another colony so far away. There was also a trade act, in place until 1824, which stressed penalties to permanent settlers. However, events such as the American Revolution distracted British attention, allowing the population to grow despite restrictions, and by the 1820s, the island was home to approximately 50 000 people. This figure rose to 140 000 by the early 1860s. The earliest government "officials" in Newfoundland were the fishing admirals, who acted as administrative authorities during the fishing season. By the early 1800s, however, the population was large enough for the British government to appoint a full-time governor. An appointed council followed in 1826, and after a report recommended a formal local government, an elected assembly had its first session in 1833. Agitation for full responsible government reached a peak in 1848. Although the British government initially refused, claiming that Newfoundland was not economically prepared, it eventually relented, awarding full responsible government to the colony in 1855. The colony's economic staple was the fishing industry. Other resources were the timber and mineral supplies. Merchants had established themselves in the island's communities and the gulf between their standard of living and that of the fishermen was a source of irritation for many Newfoundlanders. The colony relied heavily on imports for many of its supplies. In fact, these goods provided a vital source of revenue, as the government obtained the largest part of its funding through import tariffs. Newfoundland was not invited to the Charlottetown Conference, on the assumption that it had no interest in colonial union. Although its government did make inquiries about attending in August of 1864, it was unfortunately too late for the conference to accommodate a change in plan. When it was decided to hold the Québec Conference in October of 1864 for more serious discussion of the proposed union, John A. Macdonald invited Newfoundland to attend. The colony readily agreed, sending Ambrose Shea and F. B. T. Carter. They were authorized to act as observers only; they did not have a mandate to approve measures, or to act on behalf of Newfoundland. As Newfoundland was a latecomer to the union discussions, it was necessary to try to fit the colony into existing arrangements informally made at Charlottetown. This proved difficult to do in a manner that would be fair to Newfoundland and still address the concerns of the other colonies. As well, the island's two delegates stated repeatedly that they were not authorized to agree to any binding pacts. Nevertheless, the Québec Resolutions impressed both Carter and Shea and, pleased at such a generous offer, they brought the resolutions back to Newfoundland for debate in the legislature. However, they had not considered the strength of anti-Confederation feeling, and of its spokesman, Charles Fox Bennett. He played on anti-French sentiment, arousing Newfoundlanders' suspicions of Quebec. He also warned that residents would be subjected to high Canadian tax rates, and conscripted to fight far-off Canadian battles. Despite Bennett's campaign, the pro-Confederation government won the election held late in 1865; that same year, however, the legislature voted to set aside further discussion of the resolutions. As a result, it provided no authority to send delegates to the London Conference. Newfoundland continued to observe the union proceedings through July 1, 1867. The island's governor, Sir Anthony Musgrave, was invited to the opening of the first Canadian Parliament that November as an observer. The pro-Confederation government remained in power in Newfoundland for a short time after 1867, and Governor Musgrave persuaded the legislature to give union with Canada further consideration; early in the summer of 1869, an agreement was close to being ratified. Bennett and his anti-Confederation forces increased their criticism, though, disrupting any chance of success. 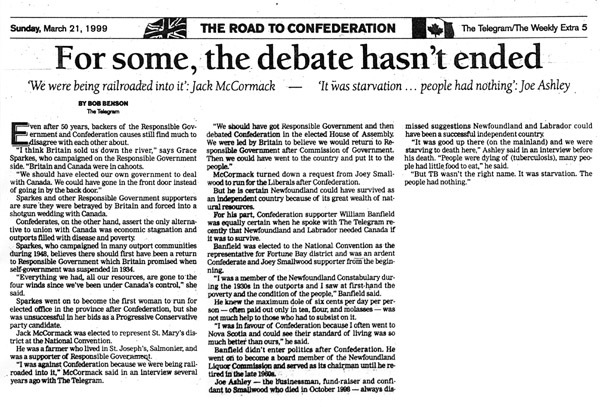 In that year's provincial election, the pro-Confederation government suffered a resounding defeat. The next serious attempt at Confederation came in 1895. For Newfoundland, which was suffering economic difficulties after a bank crash, union with Canada gained an attractive financial aspect. After rejecting Britain's offer of a royal commission to study the situation, the Newfoundland government requested a conference in April of 1895. This time, the difficulties were as much financial as political: Newfoundland wanted an agreement similar to that offered in 1888, but the Canadian government felt it could not be as generous without angering the other provinces. Talks collapsed despite British intervention. There were other factors conspiring against Confederation. 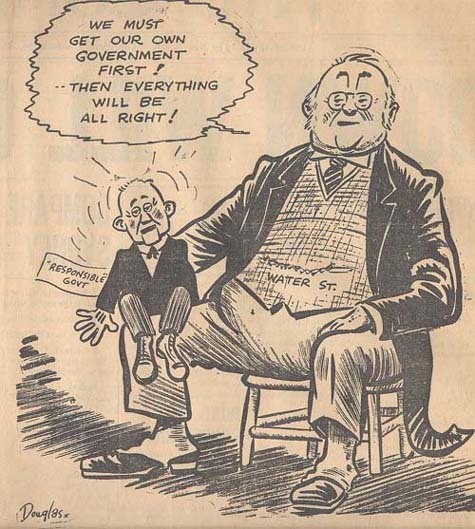 Union with Canada was often regarded as a solution to existing problems rather than as a desirable end in and of itself, and so support for the idea was never very strong. Furthermore, Newfoundlanders could observe no clear benefits for the Maritime colonies that had joined. 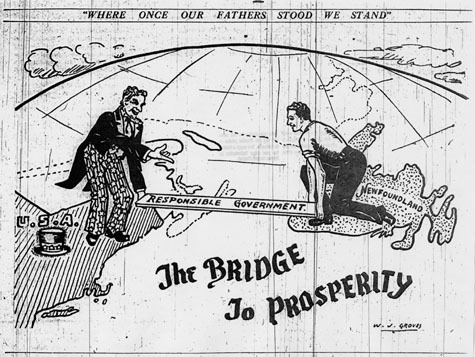 The early years of the twentieth century, particularly during World War I, were a time of prosperity for Newfoundland. The government, so long used to deprivation, took the improvement to be permanent and embarked on a period of spending that included the construction of numerous railway lines and highways, and the establishment of a variety of services, all costly ventures to maintain. Despite statistics indicating the island's resources were becoming impossibly strained, the government's spending continued throughout the 1920s. The war effort itself had been costly, decimating the population and creating a debt of $43 million by 1918. In addition, few new industries or resources were appearing to supplement the fishery, and the fishery itself was failing to keep up with modern practices. The lifestyle of the people was not adapting to the modern era; a large portion of the population remained in the outports, in relative isolation. The resolution of the Labrador boundary dispute in 1927 awarded Newfoundland more territory at a time when it could hardly afford it. By the beginning of the 1930s, the debt was nearly $100 million. Combined with the advent of the Great Depression, the colony was facing a desperate situation both economically and socially. An appeal was made to Britain for assistance. With the outbreak of World War II, Newfoundland's circumstances changed dramatically for the better. There was increased demand not only for food, but also for supplies of all sorts. As the war went on, there was also the need for the construction of new roads, buildings, and military bases. As many Newfoundlanders were gaining an unprecedented degree of prosperity, many people thought that it was time for the island to resume responsible government. Newfoundland's location in the North Atlantic made it strategically important during the war years. With part of the war being fought on the Atlantic Ocean, the island was not only a North American departure point for supply convoys heading to Britain, it was also a vital part of the North American continental defence strategy. Britain, Canada and the United States all established a military presence there. 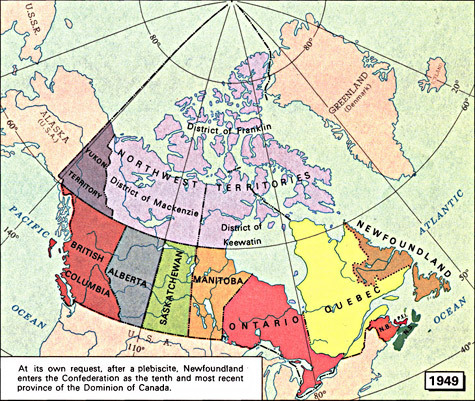 Newfoundland's increased prominence in the world prompted citizens to demand the right to influence the decisions being made. The strong American presence during the war caused Canada to renew its interest in inviting Newfoundland to join Confederation. Although Canada had always claimed a special interest in the island, it had made very few formal arrangements to maintain that interest. When the United States obtained permission from Britain to build several large military installations, with 99-year leases, Canada began to worry that this was a prelude to American possession of the region. With this in mind, the Canadian government was careful to negotiate agreements with Britain and the United States that would ensure the protection of Canada's special interests. At the same time, Canada began constructing some of its own installations (such as the airport at Goose Bay, Labrador). Such large investments were added incentives to invite Newfoundland to join the union. 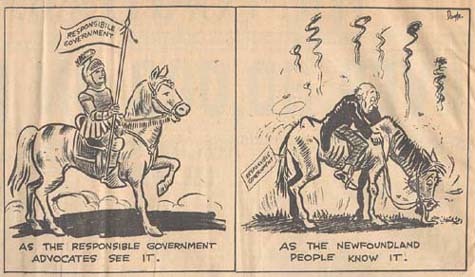 In the aftermath of World War II, it was clear that Newfoundland had emerged from the economic crisis that had led to the Commission of Government. Nonetheless, there was disagreement over what form of government should take its place. Some people favoured a return to independent responsible government, while others wished to form a union with Canada. Still others wanted to retain the Commission of Government, and there was even a faction that favoured annexation to the United States. 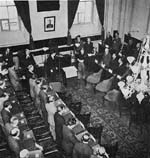 With these circumstances in mind, Britain decreed the formation of a National Convention in Newfoundland, to evaluate the Commission's performance and investigate the possibilities for Newfoundland's future. 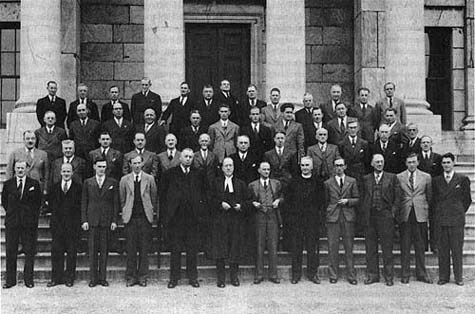 Forty-five members were elected from across Newfoundland and Labrador; delegates campaigned based on personal popularity and opinions, rather than according to a strict party platform. 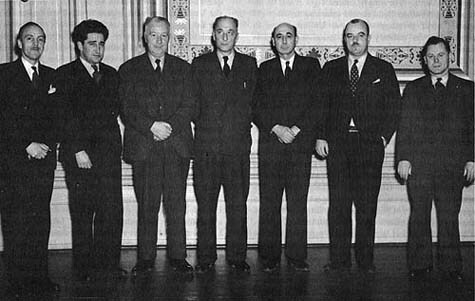 The Convention delegates met for the first time on September 11, 1946. After electing a chairman, the Convention split into subcommittees to study and report on various aspects of Newfoundland life. Debates and presentations were broadcast to the province via radio. Delegates were sharply divided over support of responsible government versus Confederation. Peter Cashin led the responsible government advocates; of the Confederation supporters, the most prominent was Joseph ("Joey") Smallwood. 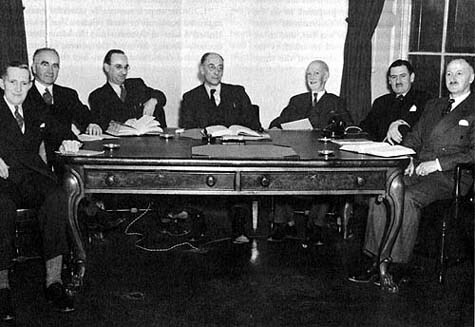 Early in 1947, the Commission of Government allowed the Convention to send a small delegation to London, to investigate what degree of financial support Britain might provide in the event of a return to responsible government. A delegation to Ottawa was also formed, to explore what terms they could reasonably expect from Canada if Confederation were chosen. However, it was stipulated that the Ottawa delegation could not be sent until the London delegation had reported on its findings. Despite the hopes of the responsible government supporters, the London delegation got a cold reception from the British government, which balked at promising any substantial amount of financial assistance if the island chose independence. Britain, itself in a poor financial condition after the war, was in no real position to offer support. It is also probable that the British government favoured Confederation, and thus wanted to make it appear as attractive an option as possible to the Convention (and through them, the people of Newfoundland). The Ottawa delegation, led by F. Gordon Bradley and Smallwood, fared rather better. It was able to negotiate draft terms for a proposed union with Canada, despite increasingly angry assertions from the Convention that they had overstepped the boundaries of their mandate, and that they should return to Newfoundland at once. 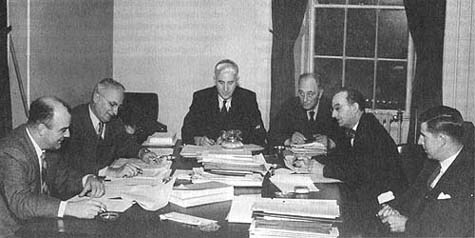 When the full Convention reconvened in late October of 1947, debate began over which government options to include on the referendum ballot to be presented to the island's citizens. Although Confederation was initially left off the ballot, it was included after pro-Confederation supporters made an appeal to Britain. 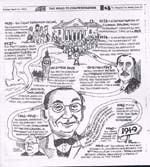 The first referendum was scheduled for June 3, 1948. Voters were to choose either the retention of the current Commission of Government, a return to responsible government, or a union with Canada. Votes were to be counted in 24 separate districts. The factions wasted no time in preparing for the campaign. The Confederate Association (CA), supporting union with Canada, was formed on February 21, 1948. It established its campaign headquarters at St. John's, and began producing a party newspaper known as The Confederate, The Responsible Government League (RGL), supporting an independent Newfoundland, was also quick to form, and also had a party newspaper, The Independent, There was a third group, known as the Economic Union Party (EUP), which favoured closer economic ties with the United States. However, the EUP failed to generate much interest, and joined forces with the RGL after the first referendum. The RGL campaign was relatively subdued. Despite evidence that its support was not strong outside of the Avalon Peninsula, it made very little effort to campaign elsewhere on the island. By contrast, the Confederation forces toured Newfoundland from one end to the other, broadcasting their message in meeting halls, from cars, from boats, and on occasion from amphibious plane. Smallwood and his fellow supporters emphasized the increased social services that Newfoundlanders would receive through a union with Canada. The responsible government campaign stressed the loss of independence, and the possible deterioration of ties with Britain, that would follow a vote for Confederation. 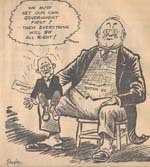 The contest was also waged in the two parties' respective newspapers, with both sides using cartoons, songs, and strongly worded articles to argue their points. Caricature: "The Merchants and Responsible Government"
Caricature: "Two Views of Responsible Government"
Caricature: "The Bridge to Prosperity"
When the ballots from the first referendum were counted, the results were inconclusive. Responsible government received 69,400 votes (44.6%); Confederation received 64,066 votes (41.1%); the Commission of Government finished third with 22,311 votes (14.3%). While responsible government had won the first round, the result was not enough for a clear majority. It was necessary to drop the Commission of Government from the ballot, and to have a second vote. If anything, the second campaign was even more vigorous and bitter than the first, with each side accusing the other of scandalous actions. 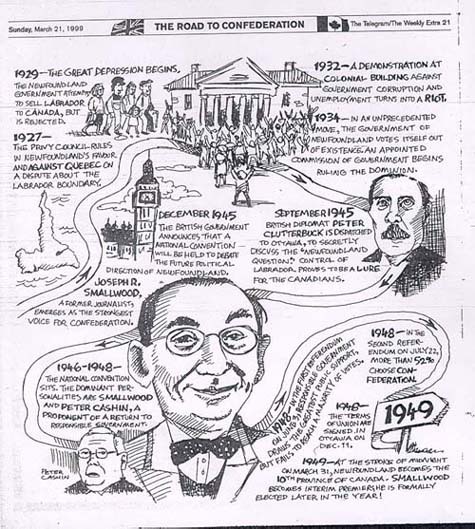 When the vote took place on July 22, 1948, the result was a victory for Confederation, with 78,323 votes (52.3%), over 71,334 votes (47.7%) for responsible government. The negotiating team that went to Ottawa was composed of National Convention members Bradley, Smallwood, Albert Walsh, Chesley Crosbie, Gordon Winter, John McEvoy, and Philip Gruchy. They met with representatives from the Department of External Affairs, including Louis St. Laurent and Lester Pearson, as well as Prime Minister Mackenzie King. The teams worked for a period of approximately two months in 1948, using the draft terms from 1947 as a starting point. 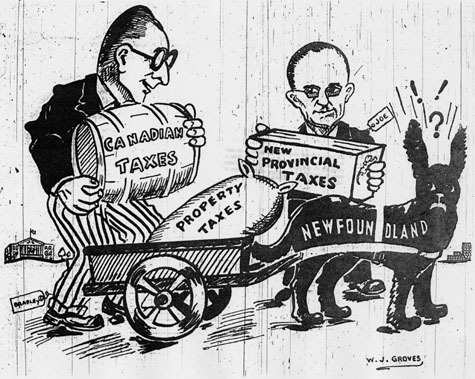 Although for the most part the process went smoothly, there were a few stumbling blocks, such as the provision of transitional payments to offset Newfoundland's deficit. The Canadian government was also reluctant to make firm commitments without a legislature present in Newfoundland. Eventually a mutually satisfactory agreement was completed on December 11, 1948. The terms agreed to were approved by an act of the Canadian Parliament. 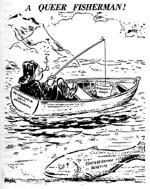 Later, at the request of the governments of Canada and Newfoundland, the British government passed the British North America Act, 1949 (since renamed the Newfoundland Act) to confirm the agreement. Albert Walsh was selected as the first lieutenant-governor of the new province. Bradley was chosen to act as the new province's first representative in the federal government; Smallwood would become the first premier. 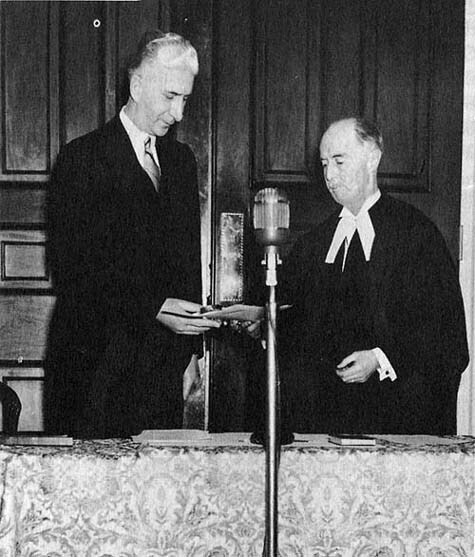 The new act itself passed with relative speed through both the Canadian and British parliaments, finally receiving royal assent on March 23, 1949. At the same time, many people were occupied with various administrative duties establishing the provincial and federal governments in the area, and combining services. Although the act creating the new province came into force just before midnight on March 31, 1949, ceremonies marking the occasion did not take place until April 1. In Newfoundland, official events were concentrated in St. John's. There was a brief swearing-in ceremony at Government House for the new lieutenant-governor, Sir Albert Walsh, who then accepted a Canadian citizenship certificate on behalf of all Newfoundlanders. Those present at the ceremony listened to a broadcast of the ceremonies in Ottawa before attending a reception. 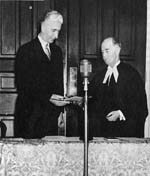 Later in the day, Walsh swore in the first members of the interim government. Despite the fierce contest that had led to this point, the day passed very quietly, with little demonstration either for or against Confederation. 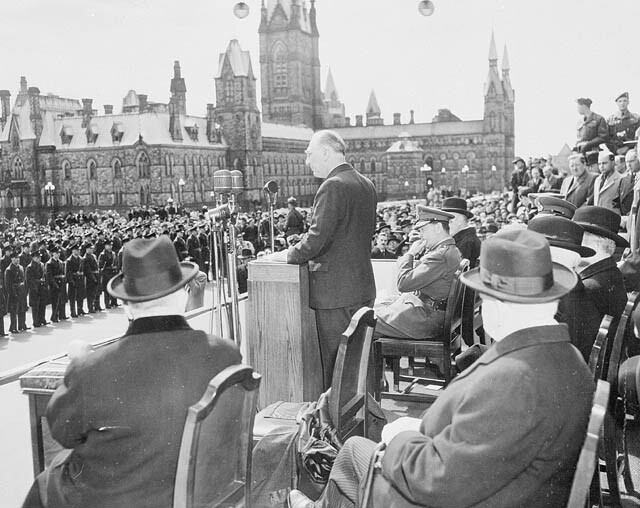 The official ceremonies at Ottawa took place on Parliament Hill. The Peace Tower carillon began by playing "Squid Jigging Ground," a traditional Newfoundland song. Official speeches then followed, coming from St. Laurent and Bradley. St. Laurent then made the first few cuts into a blank escutcheon that had been reserved for Newfoundland's coat of arms since the reconstruction of the Centre Block after the fire of 1916. After a speech from the Governor General, events concluded with the singing of "God Save the King," "Ode to Newfoundland," and "O Canada." As events were broadcast via radio, people from Newfoundland were able to listen in. 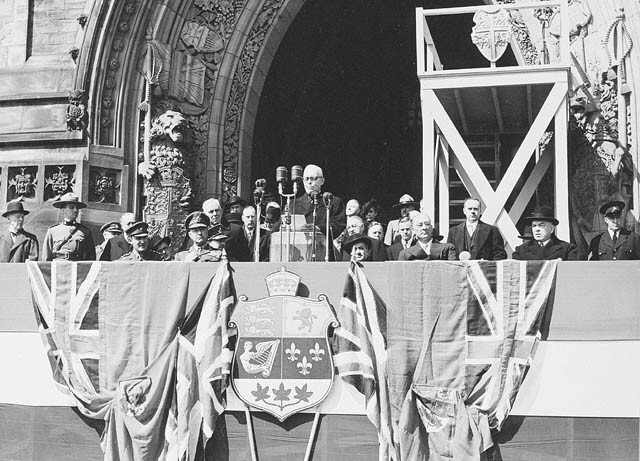 Prime Minister St. Laurent, speaking at welcoming ceremonies. Elections for the first legislative assembly of the new province were held just a few months later. As expected, the Liberal party, led by Joseph Smallwood, swept to power. It controlled the government until the early 1970s. Reaction to Confederation itself was mixed, and seemingly still is. While Confederation is generally regarded as a positive event for Newfoundland, many feel that its execution should have been far different. There have even been suggestions of a conspiracy to force Newfoundland into Confederation. (The National Film Board movie Secret Nation is an interesting, though fictional, look at this theory regarding the events of 1948-9.) Canada Day itself produces mixed emotions; for many years, July 1 has also been a time of remembrance in Newfoundland for the members of the Royal Newfoundland Regiment killed at Beaumont Hamel on that day in 1916. The fiftieth anniversary of Newfoundland's inclusion in Confederation, in 1999, provided many people with an opportunity for reflection on how Newfoundland has fared within the union. 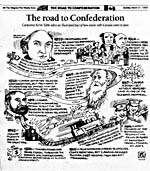 Many newspapers published stories about those who had witnessed the Confederation campaign. On December 6, 2001, as the result of a constitutional proclamation, the province's name was changed from Newfoundland to Newfoundland and Labrador. 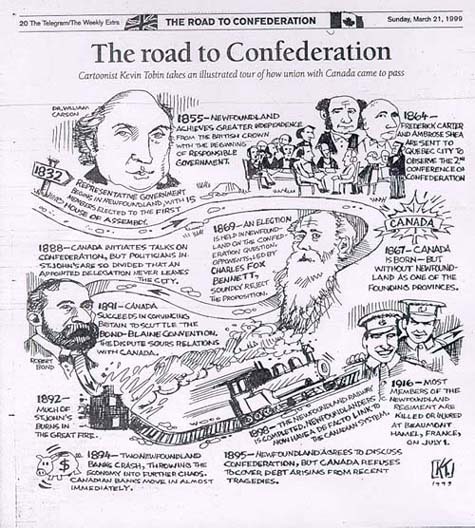 Cartoon by Kevin Tobin: "The Road to Confederation"
"For Some, the Debate Hasn't Ended"
Blake, Raymond B. -- Canadians at last : Canada integrates Newfoundland as a province. -- Toronto : University of Toronto Press, 1994. -- 252 p.
Bothwell, Robert ; Drummond, Ian ; English, John. -- Canada since 1945 : power, politics, and provincialism. -- Rev. ed. -- Toronto : University of Toronto Press, 1989. -- 508 p.
Chadwick, St. John. -- Newfoundland : island into province. -- London : Cambridge University Press, 1967. -- 268 p.
Creighton, Donald. -- The forked road : Canada 1939-1957. -- Toronto : McClelland & Stewart, 1976. 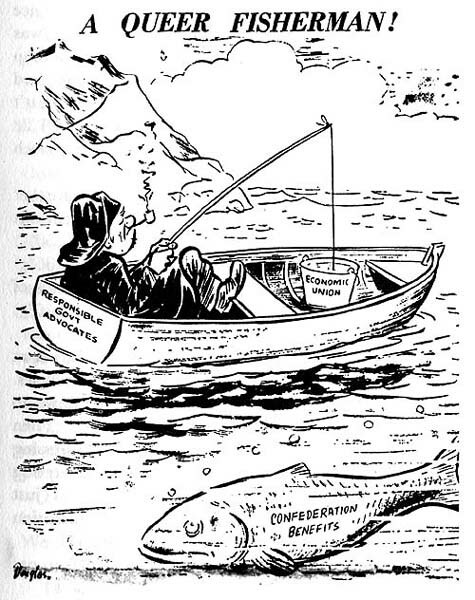 -- 319 p.
Hiller, James K. -- Confederation : deciding Newfoundland's future, 1934-1949. -- St. John's : Newfoundland Historical Society, 1998. -- 75 p.
Mackenzie, David. -- Inside the Atlantic triangle : Canada and the entry of Newfoundland into Confederation, 1939-1949. -- Toronto : University of Toronto Press, 1986. -- 285 p.